I'll go ahead and give it my highest rating. And, I hope everybody runs - not walks - to get in line for this one. Guardians of the Galaxy has spectacle and sentiment, surprises, high stakes and great lines, a reliable example of Marvel magic at work. I love this film, despite its few problems. I can't quite pinpoint why, but through its usage of sight and sound, it just speaks to me in ways that other films don't. ...the most confident bit of sci-fi world-building I've seen since the original Star Wars>. Even removed from the rest of Marvel's film catalogue, it would still stand as one of the most fun and entertaining blockbusters not just this year but of the past several years. If you're not bored of Marvel by now, this will probably be one of your favourite films of 2014. If you are bored of Marvel by now, then rest assured that this is probably the strongest of their phase two movies so far. 70s pop music can be a too-easy signifier of coolness or camp, but ... these songs are an irreverent hero's inner monologue of loneliness, love and loss, and escape. A breath of fresh air on first viewing that feels much slower in pacing once it loses the element of surprise. There's much to like in this movie; it's not brilliant, and the fate of the world is never really in danger, but it's clever and glossy and all the things you'd expect from Marvel's B-team. 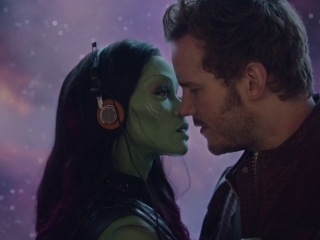 Guardians of the Galaxy isn't just one of the year's best movies. It's also a really interesting experiment with form - it blends hilarious comedy, utterly sincere classic-rock corniness, and massive hold-onto-yourself cosmic adventure. Good, honest fun and entertainment that will appease viewers of all ages as well as both those who are familiar with the Guardians team and those who heard the project announced and blankly mouthed 'who?'. In its own zany, sci-fi way, Guardians demonstrates that all cultures are not equal. It's good. Go see it. The end. By some metrics, it's the best Marvel movie yet; certainly it is the funniest and best-looking.